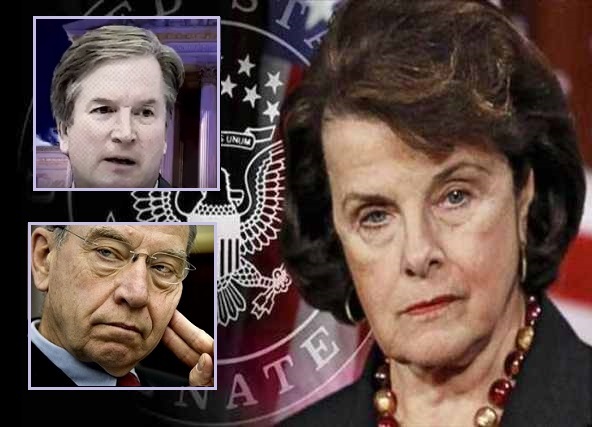 Dianne Feinstein, lifelong Bay area Leftwing sympathizer, rapidly decomposing Swamp Creature & U.S. Senate eminence, leads the charge to derail the Kavanaugh confirmation. And she’s got the goods! Right here! Top secret! A letter! An anonymous source! Anonymous out of great respect for said accuser’s privacy! Turned over to the FBI for investigation! It’s about Brett! Something he did! In…(what!? what!? what!? )…high school. Oh. Georgie Porgie, puddin’ ‘n pie/Kissed the girls and made them cry./When the boys came out to play,/Georgie Porgie ran away. Or at least that’s what’s impLIED by the Honorable Senator. Turns out no girls ever cried at schoolboy Brett’s cruel hand. In fact, 65 of them, real-life women from Kavanaugh’s deep, dark past have just written a real-life letter vouching for the Supreme Court nominee’s good character. Going back to high school. Nice try, Di. Alas, even the corrupted FBI has decided it has to do its nails that night instead of being Dianne’s date to the prom. Dianne Feinstein: another filthy-rich champion of wealth redistribution (except her own) and denying Americans (excepting herself) their God-given Constitutional rights. And then there’s the cronyism of her businessman husband coincidentally winning fat government contracts that have NO bearing on the fact that his wife is a U.S. Senator. None. And not to be too nosey, but why was a Chinese spy her chauffeur for decades? The Swamp is wide and deep, and right at home with all the slithery reptiles that lay claim to the putrid DC sewer is our own poor version of a People’s Princess Di.